You may not have heard of the Greenwich Royal Observatory, but the research done there impacts your life on a daily basis. It’s the home of the Prime Meridian and Greenwich Mean Time (GMT). This topic had never really piqued my interest before, but being at the observatory and learning about the history was fascinating. And kids will love the planetarium. The Observatory is part of Greenwich Maritime which made the very exclusive list of UNESCO World Heritage Sites. If that is not enough to convince you, the Greenwich Observatory has one of the best views of London. The Royal Greenwich Observatory needs to be on your list for London. Let me tell you more about what there is to see there and why you must visit. Greenwich is a borough in southeast London that is accessible by DLR (part of the London Underground i.e. Tube) using the Greenwich Cutty Sark stop. You can also take the MBNA Thames Clipper. The National Maritime Museum has limited parking available for £15 the day. You can easily spend a whole day as there are many things to do in Greenwich. We got lucky with the perfect weather the day we visited, so I really enjoyed the walk from our car to the Observatory. The last bit was pretty steep, but those views are really worth it. It was a little foggy when we first arrived, but when that cleared later in the day we could see all the way to St. Paul’s. The grass in this park is also some of the greenest I have ever seen. We saw lots of picnickers enjoying it. View of the Royal Greenwich Observatory from Greenwich Park. The Royal Greenwich Observatory offers several different ticket options, but to get the best prices you will want to make your purchase online. They offer a day explorer ticket which includes admission to both the Cutty Sark and the Royal Observatory. Click here for more information about the day explorer ticket. You can also purchase a combined ticket for the MBNA Thames Clipper and the Greenwich Observatory and arrive by boat. For those over 60, you can get one third off entry to the main attractions and tours on Tuesdays. If you plan to visit the Observatory often, you may want to consider becoming a member. You will need to buy your tickets to the Planetarium shows separately unless you are a member. The planetarium is popular, so get tickets for the show you want to see in advance. It’s best to book online a day or so before your visit to Greenwich or worst case, first thing when you get to the British Royal Observatory. Note: Some of the other attractions in Greenwich, like the Queen’s House and the National Maritime Museum are free! The Greenwich Observatory is open daily from 10 am to 5 pm. The last entry is 4:30 pm. Please note that the Observatory is closed December 24th-26th. 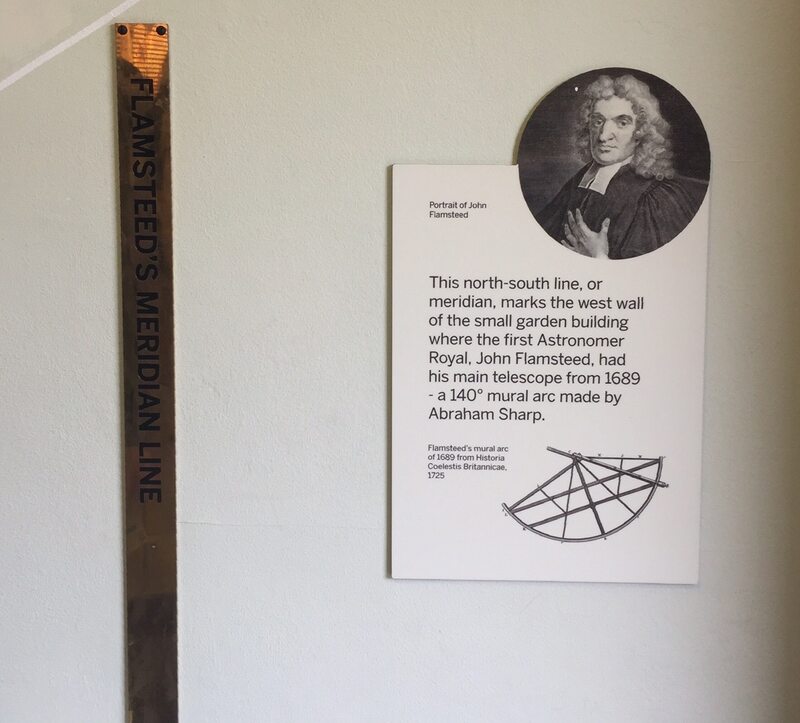 Right after you get your ticket to the London observatory, you will see a sign marking Flamsteed’s Meridian Line on the wall. This was the first Meridian line and there was even another one before the Prime Meridian Line we use today was set. The Prime Meridian divides the earth into two hemispheres, Eastern and Western similar to how the Equator marks the line between the Northern and Southern Hemispheres. The Prime Meridian is the 0 degree line for Longitude and the Equator is the 0 degree line for latitude. So of course, the first thing we had to see when we were visiting the Greenwich Royal Observatory was the Prime Meridian. Like everyone else, we had to get our pictures with one foot on either side of the Greenwich Meridian line, standing in both the Eastern and Western Hemispheres. While the Prime Meridian is supposed to be 0 degrees longitude the 0 degree point for your GPS is about 100 meters east because of the Earth’s slightly irregular shape. Anisa standing over the Prime Meridian. One foot in the Eastern Hemisphere and one foot in the Western Hemisphere. Next, we checked out the camera obscura. It is a darkened room with a pinhole that uses a mirror and lens to project an image. 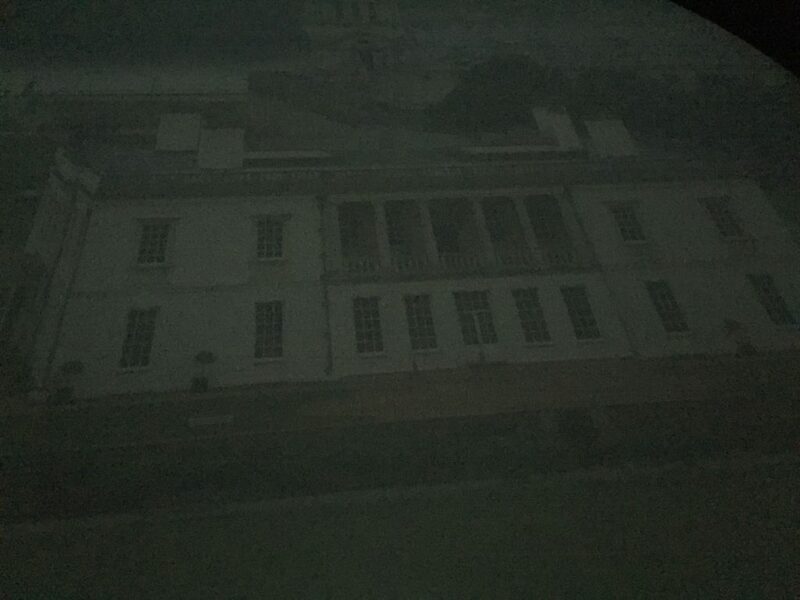 Originally it was used to study the sun, but now it projects a live image of the Queen’s House. The Queen’s House was supposedly a gift from King James I to Queen Anne of Denmark to apologize for swearing in front of her after she had accidentally killed one of his favorite dogs during a hunt. The building is important architecturally (first fully classical building in England), and famous for its former occupants (legends say there is a ghost) and art collection. When you enter the camera obscura room, take a moment to let your eyes adjust to the darkness. Then take a close look at the image. We could see people and cars moving. The image of the Queen’s House from the Camera Obscura. It’s like watching an old black and white movie. Then we visited the Flamsteed House. This is where the Royal Astronomers and their families lived. Upstairs is the Octagon Room which was designed by Christopher Wren, the architect that designed St. Paul’s and also the Naval Academy in Greenwich. I was really impressed with the trim and the ceiling. You could also see some original clocks and mock ups of telescopes and accessories. The exhibits downstairs did a great job explaining why time and the Meridian line are tied to the Observatory. There was a big problem with shipwrecks because it was hard to know where you were in the sea. You could determine your latitude by using the location of the sun at noon, but longitude is not as simple and even more difficult when at sea. You could measure how long you were gone and use that to help you determine how far you had traveled. However, there were two issues with that method – first, factors like wind and current could affect your speed and second, the clocks used during that time were pendulum ones, which could not keep accurate time on a swaying boat. One reason the Royal Observatory was established in 1675 was to solve this “Longitude Problem.” After several attempts, John Harrison created a mechanical clock that would work effectively at sea. 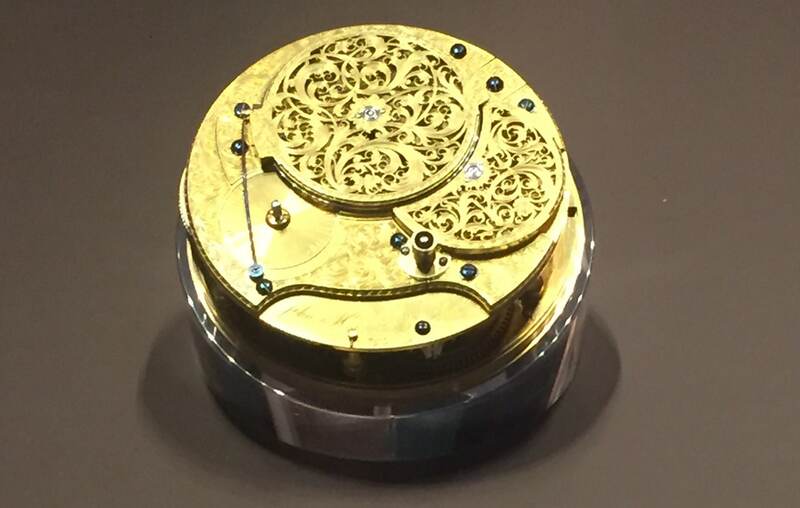 Harrison’s fourth timekeeper, which finally proved that the timekeeper method of finding longitude was practical. Longitude is connected directly with time because the Earth is divided vertically into time zones. So you can compare the time at your current location to a fixed point to determine your longitude. In 1884, the international community agreed that the Greenwich Meridian (Prime Meridian) would be that point and also established Greenwich Mean Time (GMT). All time zones would be calculated from GMT. You will notice the Greenwich Observatory clock on the gate showing GMT, known as the Shepherd Gate Clock, but it is actually controlled by a master clock inside the main building. In order to help ensure everyone was keeping to the correct time, in 1833 the Greenwich Royal Observatory implemented a ceremony where a red ball on a pole on top of the Flamsteed House drops to signify 1 pm. This ceremony still takes place today, as you can see in the video. So a little before 1 pm, we went to the courtyard to watch the Greenwich time ball drop. Just like clockwork, five minutes before the hour it started to rise up, and then two minutes to the hour reached the top. Then at 1 pm, it dropped. Of course, living in NYC, this reminded me of the ball in Times Square on New Year’s Eve. I wonder if the idea for that ball came from the Greenwich Royal Observatory? Inside the Meridian Observatory, you get to see some of the telescopes the Royal Astronomers used. I was pretty impressed with these until I saw the Great Equatorial Telescope. You climb up a spiral staircase and then you will see it. It pretty much takes up the whole dome. We timed it perfectly so that we could hear about the telescope and get a demonstration. The Greenwich Observatory telescope is over 100 years old, yet it is still the best lens telescope in England. They showed some of the images it captured on tv screens while the presenter showed how the telescope could move. The most impressive part is that the dome rotates so that you could have the opening wherever it was needed. As Russell said there was something very James Bondish to it. Then it was time for our Planetarium Show – Asteroid: Mission Extreme. It is open seating and we sat in the middle of the second row. It might have been better if we were further back but those seats fill up fast. The seats were almost too comfortable. The movie was fun, and you definitely feel like you were moving. After the movie, we checked out the exhibits at the Planetarium, which were all very interactive and kid-friendly. 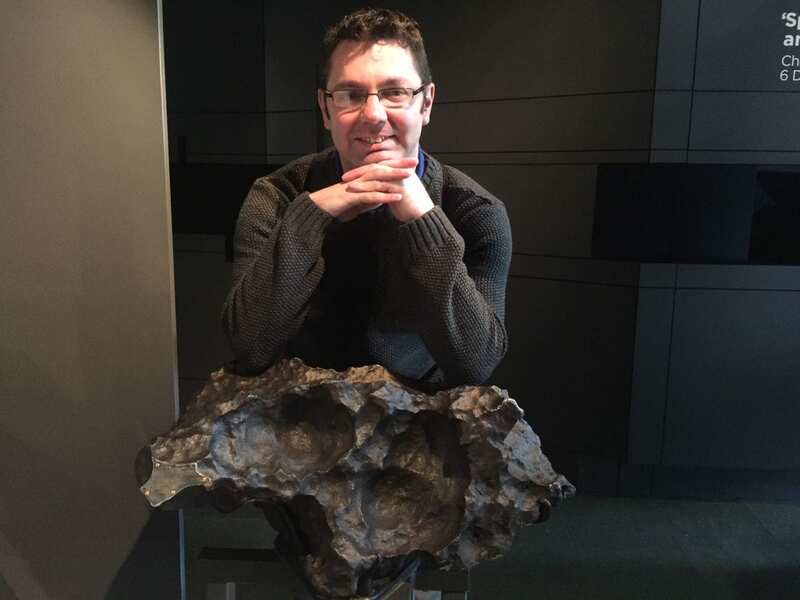 Russell with an asteroid on display at the Planetarium. It is about 4.5 billion years old. I really enjoyed my time in Greenwich and my visit to the Royal Greenwich Observatory. Additionally, I definitely learned some great trivia facts. Plus, I got my picture with the Prime Meridian. Greenwich has so much to see, so I hope to visit again and see the Cutty Sark, the O2, Queen’s House, and Maritime Museum. Have you been to Greenwich? I would love to hear about your experience. Buy your Royal Observatory tickets online and consider getting one of the package options to save money. There is no specific Greenwich Observatory parking, but you can park in the lot for the Maritime Museum. An audio guide comes with your admission ticket. You can pick it up in the courtyard right outside the ticket lobby. 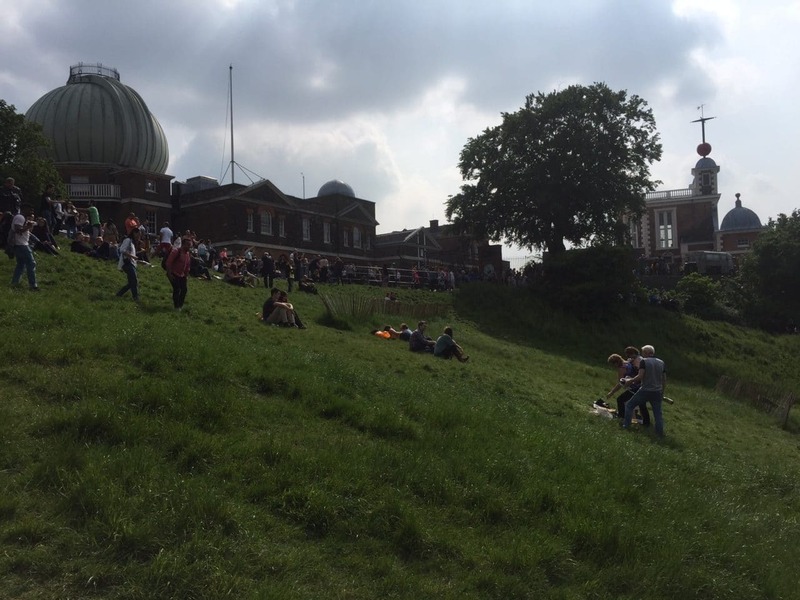 Be sure to catch the Greenwich time ball drop at 1 pm GMT. Try to catch the talk about the Great Equatorial Telescope, so that you can see the demonstration. Get your tickets for the Planetarium in advance and try to sit towards the back of the theater. Disclosure: No financial compensation was received, but the Greenwich Royal Observatory did provide complimentary tickets. As always, opinions expressed here are my own. The Observatory really is fascinating Vicky. I really want to go back and see the Queen’s house, hopefully that will re-open soon. I would like to go there one day! I read about it in grade school. Yes, Teju you should go on your next trip to London. It was really interesting and really made me think about some of the research we take for granted. Michelle – Yes I have but it was years ago so not sure I still have my equator picture – will have to look for it. You learn a lot more about history at the Greenwich Royal Observatory, which I really found fascinating. I remember there was some good shopping in Mitad del Mundo though. I’ll have to check out the observatory next time I visit London even if just for the views of the city! The camera obscura looks pretty cool too! Erika – yes, the camera obscura is very interesting and the views are really impressive, definitely worth a visit. Wow! Greenwhich Maritime sounds so interesting. I also ever heard of the UNESCO World Heritage site and started looking into it 🙂 Thanks for the great info! Candy – Glad you found it interesting. The UNESCO World Heritage sites are all very impressive, it a pretty prestigious honor. This is amazing information, surprisingly I haven’t been there while I was living in London. Surely going there next time I visit. Yes Aditi, I think a lot of people don’t realize that Greenwich is so close. Hope you make it there soon. Sounds like a great day out actually! I’ve never been. London is such a big place, you’ll always find something new to do. Great post! Thank you Suzannah. You should go if you get the chance, and yes so much to do and see in London. Interesting place to visit. Great tips. Thanks for sharing! Anita – Thanks glad you enjoyed it. Marteen – Yes it was fun and it is a funny story. I am really intrigued by the Queen’s House looking forward to it re-opening. Looks interesting. My family is traveling to London in February. Would you consider it to be kid friendly? for an 8 year old? Young kids will like the planetarium (lots of hands on exhibits) and taking pictures of the Prime Meridian. Not sure they would appreciate the exhibits about the longitude problem though. Love the picture of your foot in one hemisphere and the other foot in the other. Sounds like a really fascinating place to visit. My kind of experience 🙂 Will absolutely look to go the next time I’m in the UK. Thanks Rosemary. Getting that pic is a must when you visit the Observatory. Its the only time you will be in both the Eastern and Western Hemispheres. Nuria – Thanks for commenting. It was my first time too and I really liked it. Summertime there is probably best because the park is beautiful. And maybe the Queen’s House will be open by the time you visit. Thanks for the great guide! I never heard of this place but will definitely keep it in mind! Asdghik – You are welcome. Thanks for commenting and hope you get a chance to visit the Observatory. Clare – Glad you enjoyed it. I have not heard of that book, will have to check it out. Thank you! Cathy – The Cutty Sark is definitely on the list for my next trip to Greenwich, glad to hear that you enjoyed it. I was there in December but didn’t get to do everything you did – because I was in a rush. But it was quite cool to stand over the Prime Meridian line. 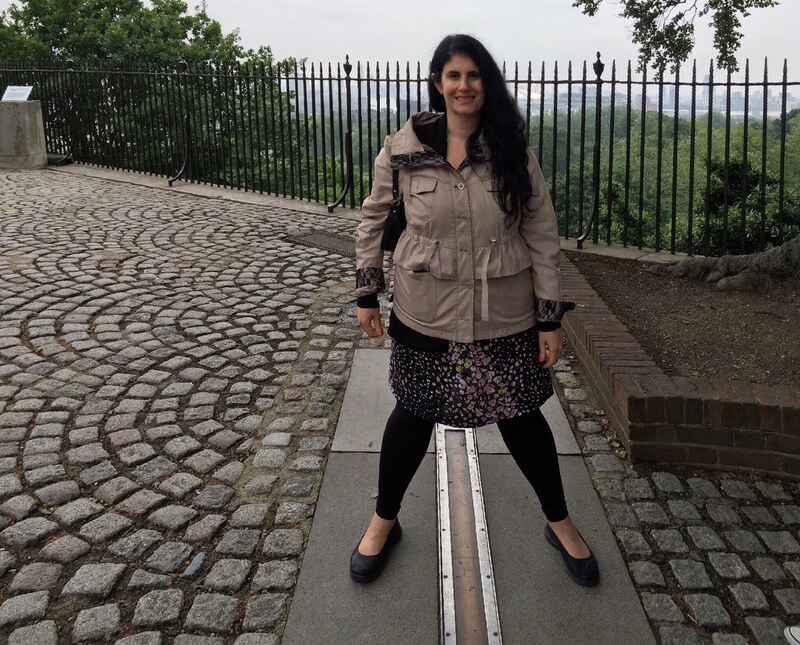 Sara – Yes the Prime Meridian picture is a must. So much to see in Greenwich, so definitely worth a return visit. So great! I visited here back in 2009 and loved it! I can’t believe more people don’t go. I would consider a must see when visiting the UK. Thanks Chantell. I think people just don’t know about it. I agree it is definitely worth a visit.